Ben's room is forever changing, I'm sure that will always be the case (much like the rest of our house). But, lately the layout has been really bothering me. If you haven't seen how it used to look, here's a good post. And here are the changes. I love having the changing table over by the window, and at night I can sit in the chair with Ben and there is less distraction for him without the door facing us. The side table and lamp have gone for now, it was just a little crowded. The chair and ottoman will come of there eventually, but for now they are still very much needed. And after all the time, I'm still loving them, so comfy to snuggle up with him in and put my feet up. The bassinet really should come right out of there, it's just taking up space, but our basement is a bit of a nightmare and I don't want to add to the pile. So, it's toy and blanket storage for now. I would like to make several more changes, including paint the walls white and replace the carpet (which, although I thought it was great when we first bought it, is looking rather dingy). But, those changes can wait. For now it's much better! 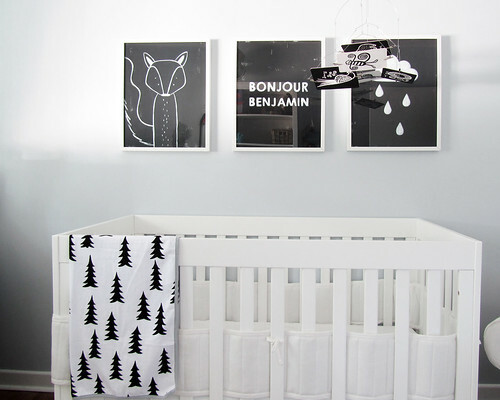 I love the 'Hello Benjamin' print above his crib. Adorable! It looks amazing. I love it. I've been wanting to "simplify" Kale's room for awhile, but am forcing myself to do something with our own room (which we've done nothing with since we moved here a year and a half ago!). Somehow doing a toddler's room is just way more fun. really love all the black and white!! Will you come decorate my house, please? Please? Pretty please? What a gorgeous space. It would be tempting to add some color but I'm glad it's left black and white. Gorgeous! The hello benjamin print is the best! Ha ha, aw thank you! Ya I figure the colour will come in through all the toys, I love having a neutral backdrop for all the kid-chaos ha ha. Adorable! You have such a great sense of style! I would love to link your nursery to my blog!